TILSON, John Quillin, a Representative from Connecticut; born in Clearbranch, Unicoi County, Tenn., April 5, 1866; attended public and private schools at Flag Pond, in his native county, and also at Mars Hill, Madison County, N.C.; was graduated from Carson-Newman College, Jefferson City, Tenn., in 1888, from Yale University, New Haven, Conn., in 1891, and from the law department of the same university in 1893; was admitted to the bar in 1897 and commenced practice in New Haven, Conn.; enlisted as a volunteer during the war with Spain and served as second lieutenant in the Sixth Regiment, United States Volunteer Infantry; member of the State house of representatives 1904-1908, serving as speaker the last two years; elected as a Republican to the Sixty-first and Sixty-second Congresses (March 4, 1909-March 3, 1913); unsuccessful candidate for reelection in 1912 to the Sixty-third Congress; served on the Mexican border as lieutenant colonel of the Second Infantry, Connecticut National Guard, in 1916; elected to the Sixty-fourth and to the eight succeeding Congresses and served from March 4, 1915, until his resignation on December 3, 1932; majority leader (Sixty-ninth, Seventieth, and Seventy-first Congresses); was not a candidate for renomination in 1932; delegate to the Republican National Convention in 1932; resumed practice of law in Washington, D.C., and New Haven, Conn.; special lecturer at Yale University on parliamentary law and procedure; died in New London, N.H., August 14, 1958; interment in private burial grounds on the family farm, Clearbranch, Tenn.
Papers: 1888-1956, 2.5 linear feet. The John Q. Tilson Papers contain correspondence, speeches, travel diaries, and documents relating to his public life. The diary of his trip to Europe in 1925 was kept while studying munitions for a report to Calvin Coolidge. Another diary reports on a trip to the Orient in 1927. Correspondence reflects his service in the Connecticut National Guard and his connection with Yale Law School. He lectured there on parliamentary law from 1930 until his death and papers from this course are also in the collection. Of particular interest in the correspondence is a letter from Calvin Coolidge (1923) and another from Cordell Hull (1940). Papers: In the Edwin Montefiore Borchard Papers, 1910-1950, 61.75 linear feet. Persons represented include John Q. Tilson. Papers: In the Walter Chauncey Camp Papers, ca. 1870-1983, 32.25 linear feet. Persons represented include John Q. Tilson. Papers: In the General Collection Manuscript Miscellany, dates and amounts unknown. Persons represented include John Q. Tilson. Papers: In the Yale-China Association Records, ca. 1900-1982, 113.75 linear feet. Persons represented include John Q. Tilson. Papers: 1910. 1 letter. Concerning Telepost Bill. Papers: 1917-1947, 0.5 foot. The collection contains correspondence of John Qu. Tilson and proofs of A Manual of Parliamentary Procedure. Topics include Tilson's career in law, the military, and politics, and the practice of law in New Haven, Connecticut. The material described in this catalog record is located in the collections of the New Haven Museum & Historical Society Library (New Haven, Connecticut). Papers: 1917-1947, 0.5 foot The collection contains correspondence of John Qu. Tilson and proofs of A Manual of Parliamentary Procedure. Topics include Tilson's career in law, the military, and politics, and the practice of law in New Haven, Connecticut. Papers: In the Berryman Family Papers, ca. 1829-1984, 11.3 linear feet. Persons represented include John Q. Tilson. Sweeting, Orville J. 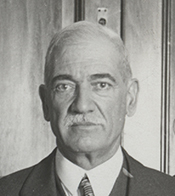 "John Q. Tilson and the Re-Apportionment Act of 1929." Western Political Quarterly 9 (June 1956): 434-53.